In Copenhagen many museums, attractions and restaurants are closed on Mondays. But don’t be fooled: the city has so many wonderful things to do on a Monday! We would love to share our best tips and tricks on how to make the most of your Monday in Copenhagen. As always, we love to guide you to the best hidden gems and sight of the beaten path. At the end, we will give you a short list of major attractions open on Mondays. If you have not noticed already Copenhagen has an outstanding culinary scene. However, most of the action is taking place during the weekend. Mondays and Tuesdays are often referred to as “industry weekend”. Nevertheless, if know where to go, Mondays can bring you some of the best dining experiences of the week. Restaurants can be more quiet, which offers the potential for wonderful conversations with the staff. Here are some of our favorite places to eat, snack and drink on Mondays. Looking for an extraordinary dinning experience on a Monday? Look no further! Kokkeriet is a Michelin restaurant dedicated to new interpretations of the classic Danish cuisine. Head chef Morten Krogholm has created an outstanding restaurant with the perfect balance between being rebellious and innovative while still respecting the traditional cuisine. The interior is relaxed, the service is superb and the food is a true culinary journey through Denmark. Kokkeriet is the perfect destination for anyone looking for a laid back fine dining experience and a chance to explore the flavors and traditions of the Danish cuisine. Restaurant Barr probably has one of the best views in Copenhagen. Situated in the former space of restaurant Noma and overlooking the harbor of Copenhagen, this is truly a gem. Restaurant and beer bar coexisting beautifully in a space where rough brick walls go hand in hand with Danish design furniture. Head chef Thorsten Schmidt and his team are focusing on the flavors, produce and traditions of the North Sea region. Hereby the old is reinvented and served in delicious modern interpretations. The trip out to this hidden gem on Refshaleøen is all worth it. La Banchina is a tiny restaurant with only 16 seats located by the harbor in the old industrial harbor area. They serve wonderful seasonal vegetables and local seafood accompanied by delicious natural wines. The place is popular destination all year around for people wanting to get out of the city center and swim in the harbors clean water. They even have their own sauna overlooking the water! This indoor food market is a must for anyone who wants to know more about local producers, unique food concepts and seasonal produce. It is a wonderful place to go on a scavenger hunt for the best local treats to bring back home, ingredients for a home cooked meal or components for the perfect picnic in the sun. Hidden gem on a side street to scenic Nyhavn: Dessertbar specialized in high-end ice cream desserts. Their flavor combinations are just as creative as their plating techniques. They also offer a beautiful selection of savory dishes, cakes, coffee and tea. Perfect destination for anyone with a sweet tooth looking for an exceptional experience! Locals favorite on Nørrebro because of laid back atmosphere and how the place transforms throughout the day. You can come for your morning coffee or cocktails and a concert at night. They focus on using local, seasonal and organic products regardless of what they serve. Wonderful place to come and get a tasty of local life in Copenhagen. Love gin and tonics? So do we! You find this hidden gem in a basement by the channels on Copenhagen, where the old fish market was located. It is one of Copenhagen’s coziest bars specialized in craft beer and G&T’s. They have 102 different kinds of gin and can make over 700 different G&T’s. You can either have the bartender mix up your own unique concoction or choose one of their recommended combinations from the menu. Exceptional craft beer by the Danish craft brewer Mikkel Bjergsø. He has made a huge impact on the Danish craft beer scene and been very successful expanding into other countries. This bar is a tribute to the Mikkeller beers and all the other talented brewers they coorperate with. With 40 different taps constantly rotated, this an exciting place to visit for any beer entusiast. For anyone interested in design, the cool interior and the visual identity of the Mikkeller is designed by the artist Keith Shore. On the hunt for a relaxed place to enjoy good wine? We got you! This local Vesterbro wine bar is specialized in natural wine. The place and the staff are relaxed, inviting and warm. Their goal is to create a wine bar for the wine connoisisseur as well as the beginner. If you are feeling hungry, make sure to try their delicious seasonal menu focused on seafood and vegetables. Now that we have made sure you are not going to starve, it is time to figure out what to do. Like mentioned in the beginning many museums and attractions are closed on Mondays. That is why we would like to tell you about some of our favorite ways to spend Mondays in Copenhagen. We love to share sights and activities off the beaten path, but will of course end with a short list of major attractions open on Mondays. Copenhageners love being close to the water whether it is by living in a houseboat, cruising around in some kind of floatation device or swimming in it. 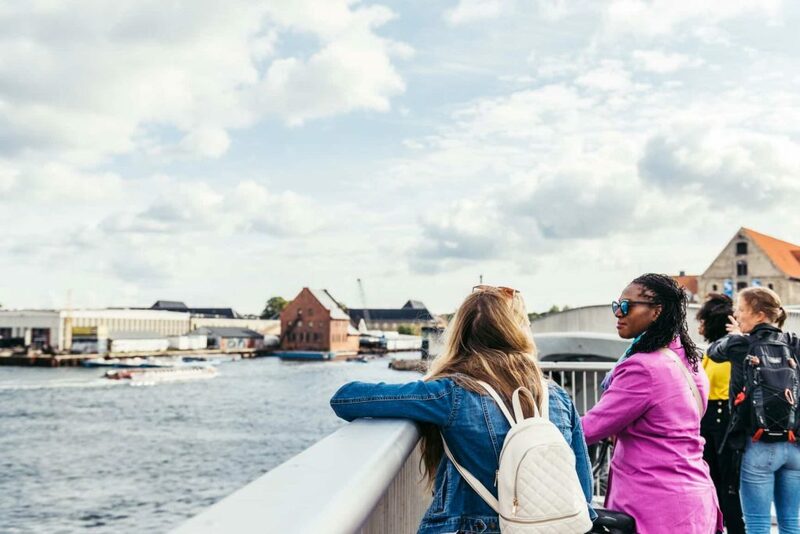 We highly recommend experiencing the city on the water, because so much of the Copenhagen lifestyle and the beauty of the city is simply best captured this way. Our favorite canal tour is Hey Captain, because they do smaller groups and have comfortable boats. If you are up for being your own captain, several companies rent out small boats by the hour. We love FriendShip because the boats have tables. It is perfect for a picnic on the water! If you want to enjoy a spa day without missing out on sightseeing, CopenHot has just the thing for you. You can rent one of their floating hot tubs, try one of their stationary one on top of a tower or relax in their sauna. Either way you will enjoy panoramic views of the city while relaxing. We know this might not be that unusual, but we want to raise the flag for biking. Copenhagen has nominated the worlds most bike friendly city and more than half of the locals bike everyday. Biking around the streets of Copenhagen is a wonderful way to see the city. 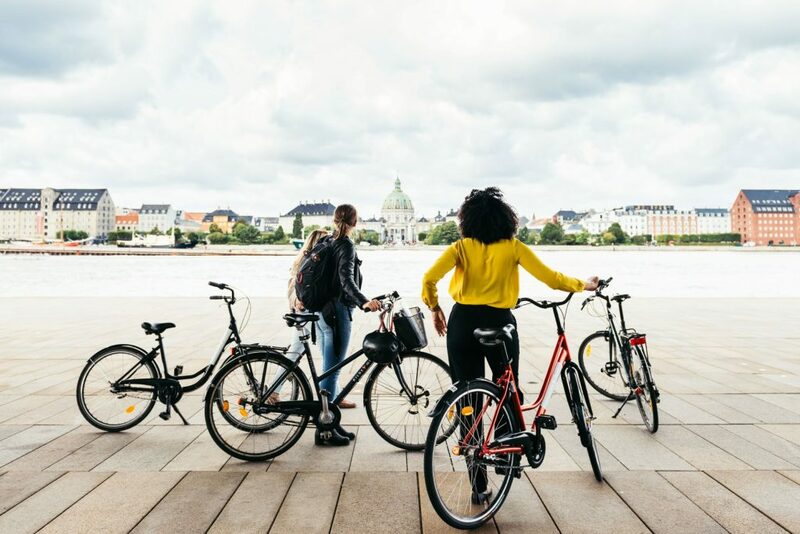 Many of the famous sights like the Royal Palace, the Little Mermaid and Nyhavn are easily explored by bike. The fun thing about biking is getting to see local neighbourhoods along the way. An easy way of renting bikes are the local city bikes. They are electrical and have digital maps to make it even easier for you to explore the city off the beaten path. In Nørrebro you find this unusual picnic destination. Amongst local it is often refered to as one of the most beautiful cemeteries in Denmark. The landscaping is more reminiscent of a park. It dates back to 1760 and has always been a place for the celebration of life as well as death. You can find the last resting place for many famous Copenhageners e.g. Hans Christian Andersen, Niels Bohr and Søren Kierkegaard. Picnicking in the cemetery became popular for people to go and see the graves of these local celebraties. It is still common practice today and we strongly encourage you to join in! Make sure to check the signs when entering. Certain parts of the cemetery are still used for burials and are therefore no picnic zones. Ready for an adventure? Just outside Copenhagen you can spend a day hunting for troll in the forrest. The installation is called The Six Forgotten Giants. All made out of recycled wood by local artist Thomas Dambo. They are hidding in the forrest on top of hills, amongst the trees or under a bridge. Trolls are important figures old Nordic mythology alongside witches, elfs and nisser. A treasure hunt for friendly trolls is the perfect way to spend a day outdoors and get to know more about folklore. The easiest way to visit all of them in one day is to rent a bike, pack up a nice lunch and jump the local train to one of the nearby stations. You bring bikes on s-trains free of charge in the specially designed bike compartments. You can either bike from gigant to gigant of jump back on the train to save your legs. The biggest area of unspoiled, protected nature in the Copenhagen areas. Just a 10-minute ride on the metro you find this astonishing area. It is big, so we recommending doing a bit of research before going and bringing food and drinks. The area offers activities ranging from hiking and fishing to golf and play grounds. At the experience center Friluftshuset you can rent a bike, hire a horse, play games or buy snacks. The Round Tower is a fun and unusual way to experience one of Copenhagen’s best views. The tower has almost no stairs, but primarily a ramp going to the top. Built to be an observatory, it is a testomony to the desire to sail the seas and explore new parts of the world. Museum dedicated to the rich history of the Danish working class. The museum covers everything cfrom the polical aspects with workers unions and evertdaylife such as living conditions and housing. You can even enjoy traditional Danish cuisine in their oldschool lunch restaurant. Curious to know more about the Vikings and their ships? This is perfect destination! Somedays you can even book a trip in replica of an original Viking ship. The museum is located in Roskilde approx. 1 hour outside Copenhagen by train. One of Denmark’s most beautiful castles. Located in Hillerød an hour outside Copenhagen with the s-trains. Great collection of art and a wonderful introduction the history of Danish monarchy. Make sure to visit the garden surrounding the caste – it is astonishing. Located nearby a castle in huge park, Copenhagen Zoo is a wonderful destination for most families. It has undergone major renovation over the last decade and working towards becoming a destination for foodies with great new restaurants. Science museum for both old and young. Exhibitions covers everything from the body to transport systems. Located just north of Copenhagen by the gigant Tuborg bottle in Hellerup. One of the worlds oldest amusement parks. Tivoli has a bit of everything: fun rides, great food and beautiful decorations and landscaping. Please note that Tivoli is closed part of the winter. Enjoy your Monday in Copenhagen!